– O Jesus, Divine Redeemer, be merciful to us and to the whole world. Amen. – Strong God, Holy God, Immortal God, have mercy on us and on the whole world. Amen. – Grace and mercy, O my Jesus, during present dangers; cover us with Thy Precious Blood. Amen. – Eternal Father, grant us mercy through the Blood of Jesus Christ, Thy only Son; grant us mercy, we beseech Thee. Amen, Amen, Amen. – Eternal Father, I offer Thee the Wounds of our Lord Jesus Christ, to heal those of our souls. – My Jesus, pardon and mercy, through the merits of Thy Holy Wounds. † At each word that you pronounce of the Chaplet of the Holy Wounds, I allow a drop of My Blood to fall upon the soul of a sinner. † Each time that you offer to My Father the merits of My divine Wounds, you win an immense fortune. † Souls that will have contemplated and honored My crown of thorns on earth, will be My crown of glory in Heaven! † I will grant all that is asked of Me through the invocation of My Holy Wounds. You will obtain everything, because it is through the merit of My Blood, which is of infinite price. With My Wounds and My Divine Heart, everything can be obtained. † From My Wounds proceed fruits of sanctity. As gold purified in the crucible becomes more beautiful, so you must put your soul and those of your companions into My sacred Wounds; there they will become perfected as gold in the furnace. You can always purify yourself in My Wounds. † My Wounds will repair yours. My Wounds will cover all your faults. Those who honor them will have a true knowledge of Jesus Christ. In meditation on them, you will always find a new love. My wounds will cover all your sins. † Plunge your actions into My Wounds and they will be of value. All your actions, even the least, soaked in My Blood, will acquire by this alone an infinite merit and will please My Heart. † In offering My Wounds for the conversion of sinners, even though the sinners are not converted, you will have the same merit before God as if they were. † When you have some trouble, something to suffer, quickly place it in My Wounds, and the pain will be alleviated. † This aspiration must often be repeated near the sick: “My Jesus, pardon and mercy through the merits of Your Holy Wounds!” This prayer will solace soul and body. † There will be no death for the soul that expires in My Holy Wounds; they give true life. † This chaplet is a counterpoise to My justice; it restrains My vengeance. 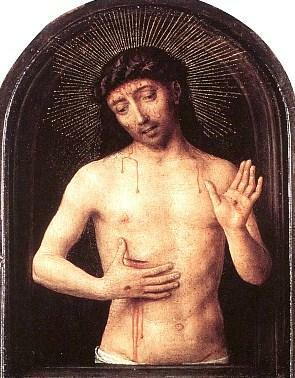 † Those who pray with humility and who meditate on My Passion, will one day participate in the glory of My divine Wounds. † The more you will have contemplated My painful Wounds on this earth, the higher will be your contemplation of them glorious in Heaven. † The soul who during life has honored the Wounds of our Lord Jesus Christ and has offered them to the Eternal Father for the Souls in Purgatory, will be accompanied at the moment of death by the Holy Virgin and the angels; and Our Lord on the Cross, all brillant in glory, will receive her and crown her. † The invocations of the Holy Wounds will obtain an incessant victory for the Church. “My Holy Wounds sanctify souls and insure their spiritual advancement… Offer Me your actions united to My Sacred Wounds, and even the smallest will have an incomprehensible value.